Game of Thrones Shield Pin Baratheon (Renly). Renly Baratheon, Lord of Storm’s End, contests for the Iron Throne with his brother Stannis. 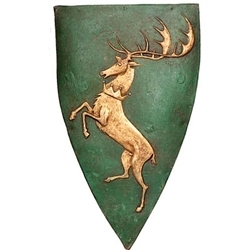 For his personal sigil, Renly altered the baratheon stag to a golden crowned stag on a field of green. Produced from the actual prop seen in the HBO series, this high-quality piece measures approximately 2.25 Inches high and 1.25 Inches across.